Machado spiked another player on Saturday. For the second time during the playoffs, Manny Machado finds himself in hot water for spiking an opposing first baseman. Ten days ago, the Milwaukee Brewers shared their disgust at the Los Angeles Dodgers third baseman stepping on the heel of first baseman Jesus Aguilar. On Saturday, Machado spiked another first baseman. This time, he got Red Sox Steve Pearce during the ninth inning. 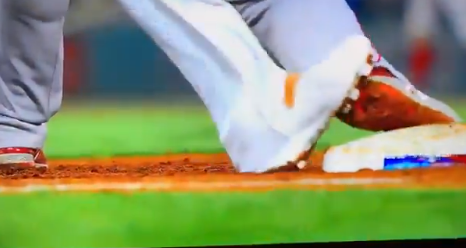 There’s little doubt Machado stepped on Pearce’s heel. But, there’s reason to believe it wasn’t intentional. Speaking with USA Today, Machado called Pearce one of his best friends whose daughter was one of his flower girls. Keep in mind, Pearce called Machado “misunderstood” and “the best person I know in this game,” before the series started against the Dodgers. It doesn’t appear Machado intentionally spiked his good friend. However, that doesn’t excuse the previous spike on Aguilar and doing it again during the World Series. He needs to watch where he’s stepping. Otherwise, Machado could hurt someone – even one of his best friend’s in the game.